Auriculotherapy. It’s a fancy word for a very simple, profound science. Auriculotherapy is essentially needle-less, electronic acupuncture. Here’s how it works: Every system in your body has a reflex point on your outer ear. By stimulating these reflex points, we can intervene with any sort of problems going on in your body’s systems. Dr. Stuckey uses state-of-the-art equipment to pinpoint the exact areas needed in order to help cure your ailments and keep you feeling great. Auriculotherapy is faster, safer, and more effective than traditional acupuncture. 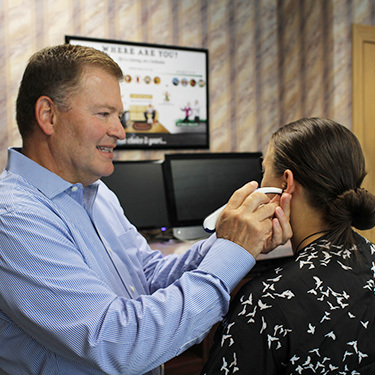 Dr. Stuckey enjoys treating his patients using auriculotherapy because of the amazing results it provides while remaining completely non-invasive. In short – no. Auriculotherapy is pain free! Some patients feel a slight tingling, and some feel none at all. There are no needles involved either. The tool we use has a small rounded metal tip, much like a ball-point pen. Besides feeling the metal touching your skin, there is a good chance you won’t feel anything at all. Give us a call today and see if Auriculotherapy is right for you.